I got the image above from Wikimedia. 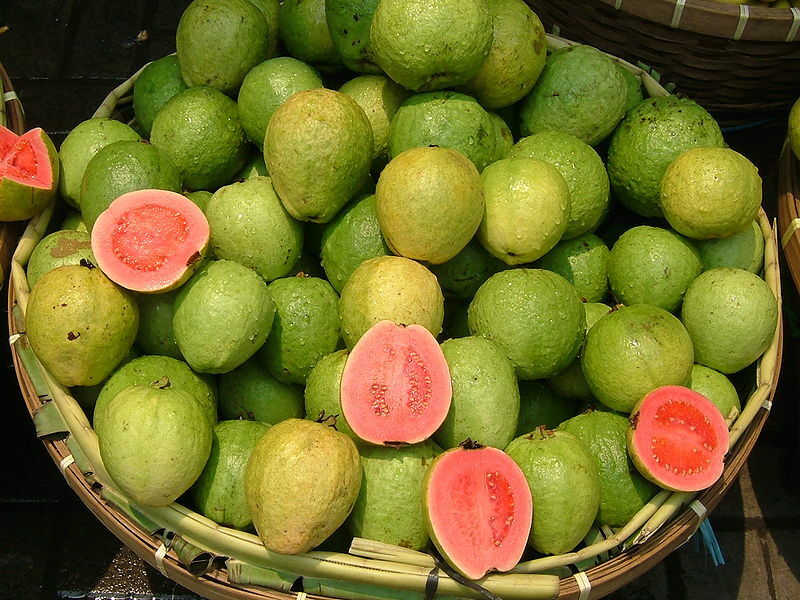 My favourite fruit at the moment is guava. It’s been in season for the past few months and it’s for sale on almost every street corner. There are two varieties: white and pink. I’ve been told that the white fruit is sweeter than the pink. But I prefer the pink because of its beautiful, brilliant colour and I’m convinced it’s sweeter too. 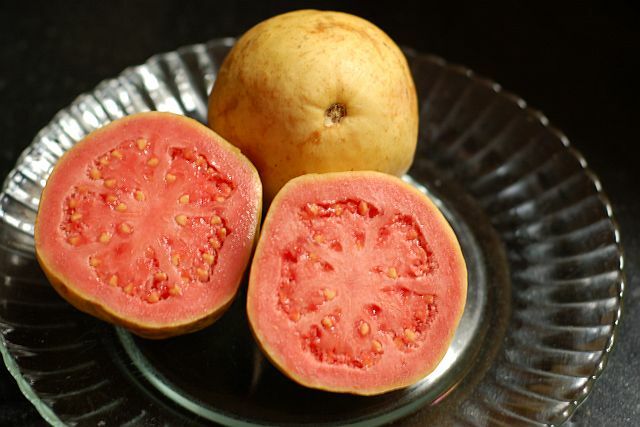 Pink guavas also seem to be bigger and rounder than the white. As guavas ripen, the outer skin becomes more yellow in colour. The guava seller at the market has a big, round basket full of guavas perched on the back of a bicycle. When he sees me coming, he starts picking out the pink ones because he knows I’m gong to ask for them. For about two months there were only white guavas available but the pink ones are back now. If you want to eat the fruit straight away, he’ll chop it up and sprinkle rock salt and chilli powder on it. But I like it the natural way: plain, no salt, no chilli. I usually ask for 5 or 6 to take home. He always gives me an extra one. Maybe because I try to speak Kannada to him, or because he’s overcharging me, or because I’m a good customer. Not sure. It's my all time favorite fruit too besides Mango that is. As a little girl growing up in Bangalore, I never bought this fruit. Always got enough of them either from the tree in my grandmother's backyard or a friend's house tree. It was fun to climb up those smooth trunked trees and pluck the ripe fruits. Thanks for bringing back those wonderful memories. We have huge guava tree in our yard. The bats love it too. Hansa, I would love to have my own guava tree! I'll bring you some guavas the next time I come to Belgium Claire! Vida, how could I forget to mention their subtle but heavenly smell?